This is an epistolary novel (swoon) written with the goal of bringing attention to women’s rights in Senegal and it’s certainly a powerful novel. The narrative is a collection of letters from the POV of a newly widowed wife whose husband has just died leaving two wives (herself and a much younger much newer one) and it gives a clear-eyed perspective into what it’s like to live as a woman in a polygamous culture. Her friend (to whom the letters are written) elects to leave her husband when he takes a second wife, even though doing so puts her at an economic and societal disadvantage — she must do what she must do to maintain her dignity. The narrator, on the other hand, has elected to stay with her husband when he chooses to take a second wife (although she hates having to accept this), and it is this comparison of the two Senegalese women’s lives that form the basis of the narrative structure. The narrator’s husband has been married to her for more than 12 years – they have children and an established life together – and the new wife he takes is one of her daughter’s friends, much younger and prettier and now very much spoiled by her husband’s wealth (developed, I might add, by the support of his wife #1). Her husband now ignores his #1 family and wife (with his 12 children), and as you might expect, the book simmers with the anger of wife #1 as she relates the story of her life, both before wife #2 and after. With the husband now dead, both wives are in the 40 days of Islamic required mourning, and this leaves ample time to meditate on her life so far. It’s a powerful construct. 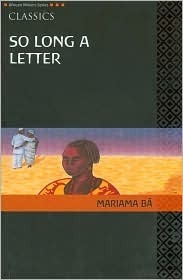 Bâ writes as tightly as a spring ready to be released, and describes life in Senegal extremely well. 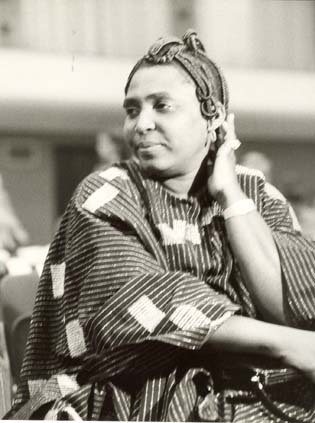 Life in both the city and the rural villages, the early stages of the labor movement (which is what her husband has done for a career), the machinations of politics, the rights of women and children, and the oncoming unstoppable force of the end of Colonial Rule and changing societal roles – all of these mean that a New Africa is on the way whether Old Africa is ready or not. I adored this book, although it was not an easy read subject-wise, but the pure emotion that was elicited via the text was incredible. I’m not sure what else (if anything) Bâ has written, but I will be looking for her name from now on. Highly recommended. This entry was posted in Uncategorized and tagged Africa, domestic, Fiction, senegal, women's history by lizipaulk. Bookmark the permalink.